Marteilioides chungmuensis is responsible for marteilioidosis, an oocyte infection of Pacific oysters Crassostrea gigas. Infected eggs are released or retained within the follicle, leading to visible distension of the mantle surface and thus to marketability loss of infected oysters. Infection can also cause spawning failure by delaying spawning and destroying ripe oyster oocytes. Marteilioides chungmuensis is a protistan of the phylum Paramyxea, which infects cytoplasm of mature oocytes of Pacific oysters (picture 1), and affects significantly the reproductive output of infected female oysters. The vegetative stages have amoeboid primary cells that cleave internally to form secondary cells (sporonts) and sporulation consists of sporonts that produce a single pluricellular spore and then degenerate such that the spore is enveloped by a cytoplasmic residuum and the plasmalemma of the sporont. Picture 1 : Gonadal tissue of Crassostrea gigas showing numerous ovocytes infected by Marteilioides chungmuensis primary and secondary cells (H&E stain). Parasites similar to Marteilioïdes chungmuensis were described in Crassostrea echinata (Australia) and Ruditapes philippinarum (Korea). However, molecular parasite characterization has not been performed yet. Some of the infections described as "oyster egg diseases” may be attributed to M. chungmuensis. Imprints can be made by using nodules sometimes present on infected gonad. Marteilioides chungmuensis is observed in the cytoplasm of infected ova (picture 2) or sometimes extracellularly, liberated from the ova. The parasite can be present under different stages. Picture 2 : Imprint of ovocytes from Crassostrea gigas gonadal tissue showing Marteilioides chungmuensis primary cells with sporont(s) and one sporont (upper right ovocyte) containing four spores (Hemacolor® stain). Stem (primary) cells contain secondary cells. These may, in turn, contain developing sporonts, giving rise to a single tertiary cell by endogenous budding. Each tertiary cell forms a tricellular spore by internal cleavage. 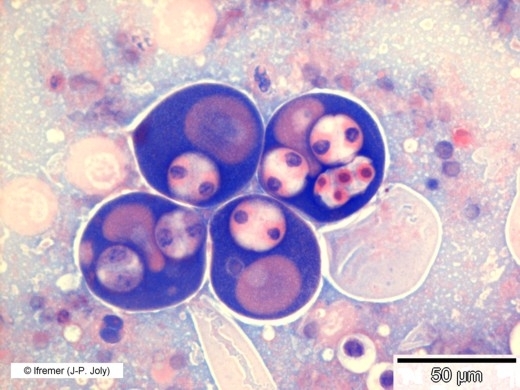 Histology (picture 1) allows observing parasites inside ovocytes. Different parasite stages can be observed and are similar to those reported for imprints. The parasite is quite easy to recognize because of its specific cellular localisation and because of its size. However, initial infection and primary cells can be more difficult to detect. A nested-PCR using primers OPF-2-OPR-2 and OPF-3-OPR-3 and amplifying 672 and 447 bp of the SSU rDNA respectively was developed to detect the parasite in Crassostrea gigas (Itoh et al. 2004). The detection limit of this technique has not been determined yet. However, by comparing histology and PCR results, this last technique allows to detect the parasite in some oysters found negative by the first one suggesting that PCR is more sensitive than histology. These primers could not amplify other Paramyxean like Marteilia refringens and M. sydneyi. An in situ hybridization (ISH) protocol has also been developed using three Dig-labelled oligonucleotide probes MCSP-05, MCSP-06 and 6-R (Itoh et al. 2003b). No non-specific binding was observed when tests were performed with other Paramyxean like Marteilia refringens and M. sydneyi. ISH can help to detect early or immature stages of the parasite which are more difficult to detect in traditional histological sections. It has been used to define the life cycle of M. chungmuensis (Itoh et al. 2004). The PCR protocol previously described in the section “screening techniques” can also be used as a confirmatory technique. The in situ hybridization protocol previously described in the section “screening techniques” can also be used as a confirmatory technique. Transmission electron microscopy is time consuming and cannot be applied in routine but is recommended when Marteilioides like parasites are described in a new host species. Moreover, transmission electron microscopy can help to differentiate M. chungmuensis from another member of this genus: M. branchialis (found in Australia). The last one is characterized by the presence of two concentric cells (rather than three) within the spore. In addition, M. chungmuensis in Crassostrea gigas contains only two to three sporonts per primary/stem cell (Comps et al. 1987) compared with two to six for M. branchialis (Hine et al. 2000). Multivesicular bodies resembling those of Marteilia sp. are present in M. branchialis stem cells but absent from those of M. chungmuensis. Sequencing is recommended as one of the final steps for confirmatory diagnostic. Targeted region is SSU rDNA. Obtained sequences should be compared with available ones in gene banks. Protocols for PCR and in situ hybridization are available in pre cited articles. However both techniques need to be validated and more specifically specificity and sensitivity values are lacking. Abnormal masses with a nodular appearance can be observed in highly infected individuals. Nodules, if present, should be used for smears which enable the rapid detection of Marteilioïdes chungmuensis. A piece of gonad should also be fixed in ethanol for molecular analysis and the remaining gonad tissue can be fixed in Davidson’s fixative for histological examination. Marteilioïdes chungmuensis is not listed by the EU legislation. Marteilioïdes chungmuensis is not listed by the OIE. It is recommended to use histology, cytology and PCR for screening, and PCR, DNA sequencing, ISH (in situ hybridization), and/or Transmission Electron Microscopy for confirmation. Comps, M., M.S. Park and I. Desportes (1987). Fine structure of Marteilioides chungmuensis n.g. n.sp., parasite of the oocytes of the oyster Crassostrea gigas. Aquaculture 67: 264-265. Hine, P.M. and T. Thorne. (2000) A survey of some parasites and diseases of several species of bivalve mollusc in northern Western Australia. Diseases of Aquatic Organisms 40: 67-78. Itoh, N., Oda, T., et al. (2003a). Isolation and 18S ribosomal DNA gene sequences of Marteilioides chungmuensis (Paramyxea), an ovarian parasite of the Pacific oyster Crassostrea gigas. Diseases of Aquatic Organisms, 54 (2), 163-169. Itoh, N., Oda, T., et al. (2003b). DNA probes for detection of Marteilioides chungmuensis from the ovary of Pacific oyster Crassostrea gigas. Fish Pathology (Tokyo) 38: 163-169. Itoh, N., H. Komiyama et al. (2004). 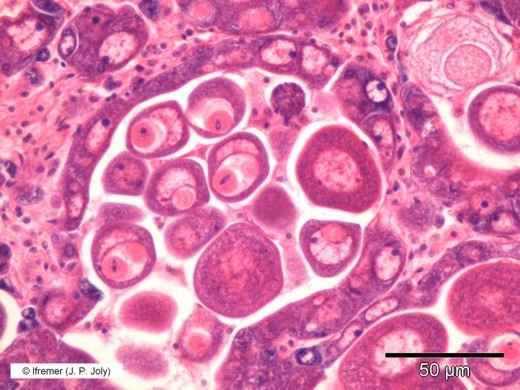 Early developmental stages of a protozoan parasite, Marteilioides chungmuensis (Paramyxea), the causative agent of the ovary enlargement disease in the Pacific oyster, Crassostrea gigas. International Journal for Parasitology 34: 1129-1135.